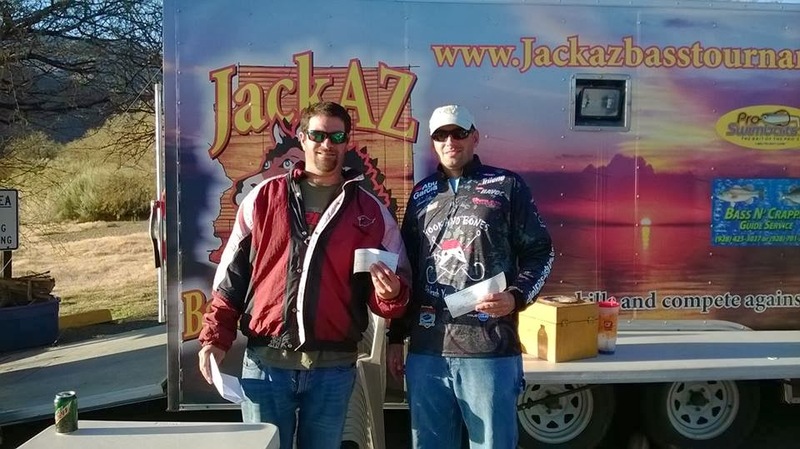 I fished the JackAz Team Tournament at Apache Lake on January 4th with my cousin Jim Davis. We were greeted by some pretty nice weather as it was fairly warm for January. The water was abnormally clear for Apache Lake but luckily we had a fair amount of wind most of the day that really helped the bite. 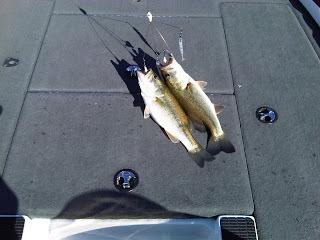 We did most of our damage throwing both a Berkley Hollow Belly Swimbait and a Berkley Havoc Sick Fish Swimbait. Once the wind died down later in the day we put a few more fish in the boat with a texas rigged Havoc Rocket Craw. We hooked and landed quite a few fish throughout the majority of the day and wound up weighing in a mixed bag consisting of two largemouth and three smallmouth bass that tipped the scales at 16.40lbs, good enough for 5th place. 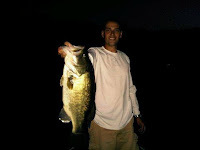 Our bag included a 5.18lb largemouth which ended up taking second place big fish. It's always nice to be able to head home with a little extra money in the pockets. I just wrapped my last tournament of 2013. 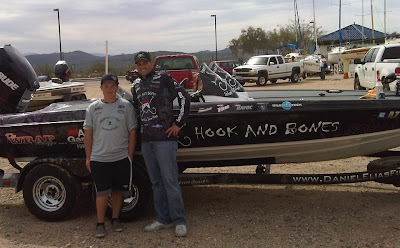 I fished the Total Bass Addicts tournament at Bartlett Lake, Az on December 14th with my team partner Butch Nessline. We were able to do a little prefishing the day before and it was windy and very cold. We put together a little pattern but as the tournament started the next day we completely abandoned it since it was much warmer and much windier. The morning started out pretty good and I landed quite a few fish on a chatterbait and we had out limit in about 30 minutes. As the day wore on the wind died down and we slowed down and fished a whole bunch of main lake points. I threw the new Berkley Powerbait Chigger Quad the majority of the afternoon. This was the first time I've thrown the Chigger Quad and I've got to say that I'm thoroughly impressed! I caught a bunch of fish on that thing but unfortunately most of them were rats. Butch added a couple fish to our limit with his super secret jig that he likes to throw. I can't tell you what it is since I've been sworn to secrecy but suffice to say anyone who knows butch knows the exact jig I'm talking about. We wound up weighing in 10.50lbs which is usually enough to win on Bartlett but the weights were pretty good out there and we wound up finishing in 9th place. When I saw that Total Bass Addicts was holding a tournament on Apache Lake on November 30th I got really excited. I have some really fond memories from back in my teenage years when I fished with Apache Bass Club. They always help the final tournament of the year at Apache lake sometime in November and back then the smallmouth fishing there was phenomenal. I was excited to go back and see if the fishing was like I remembered. I fished this tournament with my team partner Butch Nessline. During pre-fish I was catching the bass really well on a spinnerbait and Butch was throwing a football jig with a Berkley Chigger craw trailer without much success. On tournament day we decided to stick with the same baits even though the jig didn't produce well because we know that jigs tend to catch the larger largemouth there this time of year. On tournament day everything changed and Butch was the one getting all of the bites on his jig and I only landed one keeper on the spinnerbait. We ended up weighing in a mixed bag of smallmouth and largemouth for a total 12.95lbs and finished in 5th place. I always enjoy fishing with my father so when he asked me if I wanted to go fun fishing this week I couldn't refuse. 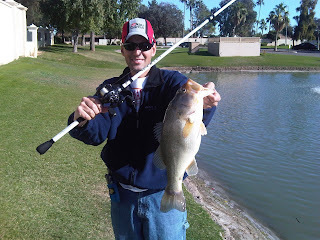 I decided that I would take him to Saguaro Lake because the fishing can be very good there this time of year. Luckily I was right because my dad and I absolutely crushed the big fish. We caught fish from the moment we got there until the moment we left. My Dad is much more comfortable with a spinning rod than a baitcaster so he reached into my rod locker and pulled out my new Abu Garcia Villain shakey head rod that I had rigged up with a Berkley Havoc Bottom Hopper worm. He made his first cast of the day and caught a seven pounder! About 5 minutes later he caught another fish that weighed a tad over six pounds. Over the course of the day we caught a whole bunch of fish and my Dad landed two more over five pounds on a drop shot. I added an eight pounder followed by a nine pounder a couple hours later. All of my big fish for the day were caught on the same worm that my father was drop shotting which was a 6" Berkley hand Poured Finesse Worm. We held our three biggest fish in the livewell since we were having a little bragging rights tournament against my good friend Tai Au and his partner. Tai was able to to take this great picture when we weighed them. I fished the Total Bass Addicts Team Championship on Roosevelt Lake, Az with my team partner Butch Nessline on September 6th & 7th. The bite was pretty difficult and the bigger fish were tough to come by. We ended up finishing in 10th place with a two day total 19.86lbs. 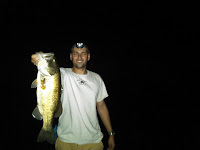 The vast majority of our fish were caught on various topwater baits. The majority of the time I alternated between four baits (spook, vixen, buzzbait, and frog). 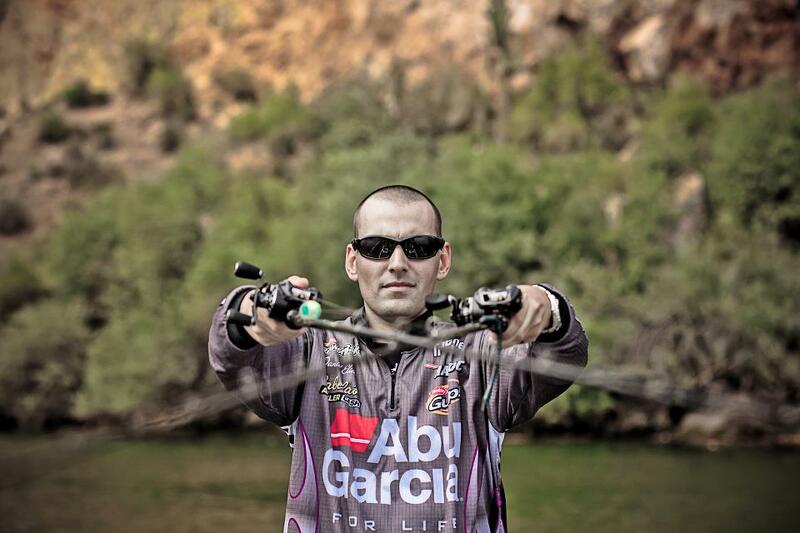 I've really come to love my Abu Garcia Veritas topwater rods. I prefer the 7'3" MH casting model which I have found is perfect for large walking baits, buzzbaits, and some open water froggin'. Congratulations are in order to my good friend Dustin Robinson and his partner Alex Colacino for smoking the field with a winning weight of 28.49lbs. Great job boys! I just fished the latest Total Bass Addicts Night tournament at Saguaro Lake with my team partner Butch Nessline on August 16th. We put together a great bag of fish that weighed 21.31lbs. Unfortunately for us there were a few other teams that had some pretty impressive bags. We just couldn't find that kicker fish as our five fish all looked like clones. Overall I can't complain as our fish averaged over 4.25lbs a piece. We finished in 5th place and we were able to take home a little money for our efforts. 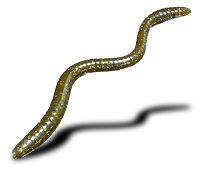 We caught a number of fish on 10" Berkley Power Worms but the majority of our bigger fish in this tournament came on the New Berkley Havoc Federale Worm (pictured below). My trip to North Carolina to fish in the Hook and Bones Redfish Open Tournament on August 10th was absolutely incredible! Every single person we met immediately treated us like family. The hospitality in that part of the country is simply amazing. We ate like kings at the Saltwater Grill on multiple occasions as the seafood there was fantastic. I really want to thank all the people that made the trip so enjoyable, especially John Moore and Anthony Grady who own Hook and Bones, Todd Matthews who was my team partner for the event, and my Cousin Jamie Quilici who graciously let me stay at her house while traveling through Raleigh on our way to Swansboro.  Hook and Bones truly put on a first class event and I'm very lucky that they invited me out there to take part in it. What a great experience, I can't wait to go back! I have been doing quite a bit of night fishing at Saguaro Lake, Az over the past two months and the fishing has been phenomenal! It is absolutely awesome to see fishing so good considering that just a few years ago I would describe the fishing there as pretty poor. In 2004 and 2005 there were major fish kills caused by golden alga that wiped out the vast majority of the bass population. 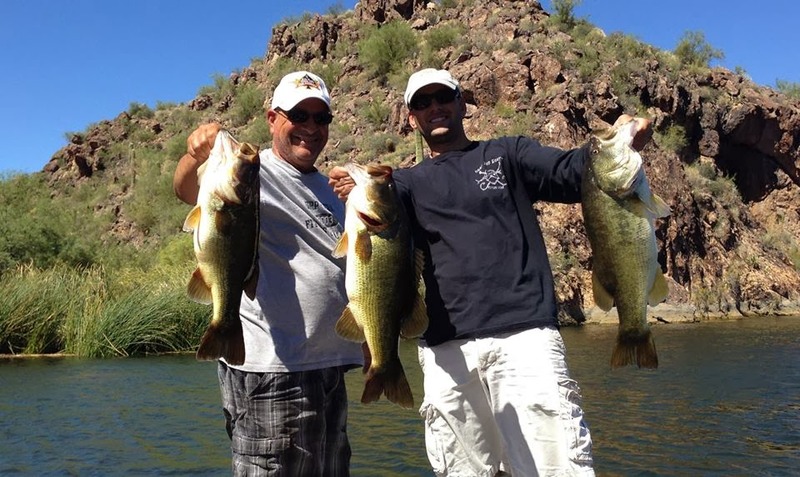 Prior to the fish kills Saguaro Lake produced some of the biggest bass in the state of Arizona. Fortunately, after the fish kills happened the United Arizona Anglers Foundation (UAAF) raised money and stocked Saguaro Lake (as well as Canyon and Apache Lakes which also suffered fish kills) with northern and florida strain largemouth bass. Over the last few years those stockings have really paid off and the fishing has been steadily improving. Bass over five pound are now commonplace and I've actually landed a handful that weighed more than 10lbs. I feel very fortunate to have such an amazing fishery so close to home and I always look forward to fishing there. 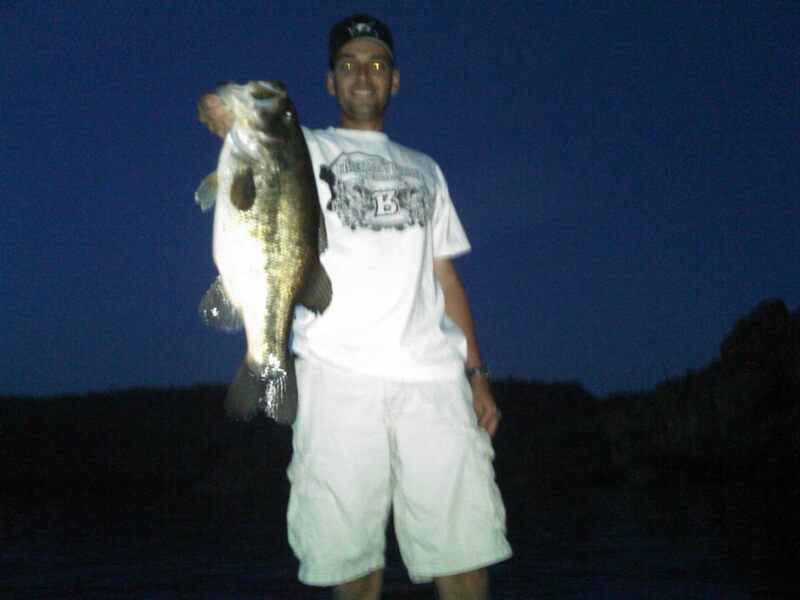 I fished the Chandler Bass Open at Saguaro Lake, Az on July 18th, 2013. It's a very short tournament, lasting just 4 hours and such only has a 3 fish limit. The fishing was pretty stellar and I weighed in a 3 fish limit of 16.04 lbs. That's an average of over pounds per fish. What an awesome fishery! All three fish weighed in were landed on a 10" Berkley Power Worm. Did I mention I love Saguaro Lake! I was a volunteer boat captain for the Phoenix Jr. Bassmasters tournament at Lake Pleasant yesterday. I didn't fish but I really enjoyed watching these youngsters fish and I'm glad I could share some knowledge and my passion for the sport with them. I took out junior angler Shane Edgar who ended up winning the tournament, Great job Shane! There's a bunch of very talented boys and girls in that organization that really love to fish....it was truly an honor to be able to help out. I would especially like to thank Murray White for all his hard work in making sure these kids can get out on the water and fish. They are the future conservationists and stewards of the sport I love and it's great to see them involved in competitive fishing at such a young age. I headed out to Saguaro Lake on Sunday to do another photoshoot with photographer Baha Kandirmaz. It was a bit cool out and the wind was blowing very hard at times but I'm confident we got some great shots. I had as photoshoot with him this past August at Saguaro Lake and those pictures turned out amazing so I expect these will look just as good. I just picked up a new sponsor whose logos will be featured on my boat and jersey this season so Baha and I went out to get some great new photos with their new logos. I will be making a big announcement about this exciting new sponsor and I will post pictures of the new boat wrap and jersey in the very near future so check back soon. You can also subscribe to any updates on my blog by scrolling to the bottom of the page and entering your e-mail address in the "Follow by Email" box and clicking "Submit". After you subscribe an email will automatically be sent to your inbox when my site has been updated. I had the chance to head up to Apache Lake, AZ over the weekend to do a little fishing. It has probably been over a year since I was last up there so I was excited to get out and wet the line. For those of you who have never been there the road that takes you into Apache Lake is downright frightening. You have to travel miles down this little narrow dirt road that hugs the side of a mountain. During most of the drive you'll be hugging the cliff wall. On one side of the road the cliffs rise above you hundreds of feet. On the other side the cliff goes hundreds of feet, straight down! Naturally, there are absolutely no guard rails anywhere along this washboard trail. The trip in is definitely worth the effort because when you finally arrive at the lake you're greeted with what I believe is the most beautiful lake in Arizona. There was a massive fish kill in Apache Lake a number of years ago that decimated the large population of smallmouth bass that lived there. Over the last couple years there have been some quality largemouth landed and I even heard of a few quality smallmouth being landed as well. On friday I had quite a bit of success catching largemouth on skirted football jigs tipped with Berkley Chigger Craw trailers. On Saturday I was greeted with temperatures below freezing and I soon faced snow and winds in excess of 20mph. With the nasty cold front coming through it bacame very difficult to get bit. I ended up "going old school" and started slow rolling a 3/8oz rooster tail over man lake points near spawning areas. This was a tactic that I used many years ago and would sometimes produce giant bags of smallmouth. I didn't catch a giant bag by any stretch of the immagination but I was able to land quite a few quality smallmouth bass on that little spinner. Fortunately I made it home safe through the snow and rain and I live to fish another day. I fished the Monterey Bass Company Super Teams Tournament at Lake Pleasant, AZ on November 10th. It was a very strange day for Arizona. The weather was very cool in the morning, warmed up a little by mid morning but as the sun started to rise in the sky it progressively got colder and colder....very strange! I had finally got my hands on the new Berkley Havoc Sick fish swimbaits and I started and finished the day throwing one.I started in the morning by burning it right under the surface and I caught them pretty good during the first few hours. As the day wore on the bite got a bit tougher and I had to slow roll the bait around secondary points to get bit. Unfortunately I had a 5 pounder come unbuttoned right at the boat that ultimately cost us the tournament. As it stood we were able to wrangle in 10.78lbs, good enough for 3rd place. I was out on Saguaro Lake, AZ a couple days ago to do a photoshoot with Baha Kandirmaz. Unfortunately I have only seen one picture of my photoshoot so far but it looked pretty cool. Even though I haven't seen my pictures yet I have seen some of his work and it look amazing so I'm excited to see what my pictures look like. We got a bit of a late start due to a rain shower that decided to move in early in the morning. After the rain passed it was almost 9:00am and the temperatures quickly rose to about 112 degrees, and did I mention it was humid... I sure hope Baha is good with Photoshop because he's got a lot of sweat to edit off my face! Here's the only picture I've seen so far, I'll be sure to post some on here in the gallery. * Butch apologizes for taking the picture while I was looking away. I Caught a Dead Guy! Check out this article written about me and an unusual catch I had back in 2000. I just finished fishing and desperately trying to defend our title at the 2nd Annual Lucas Oil Open at Lake Pleasant on April 14th-15th.Conditions were much different this year as a major cold front descended on the lake Saturday morning bringing heavy wind. Sunday brought even colder temperatures and heavy rain and hail. The front pushed many of the bed fish down off the beds and back into staging areas and forced us to called an audible which essentially abandoned the bed fish that we marked pre-fish. We instead decided to focus on two areas that were holding some large pre-spawn fish. We spent Day 1 roaming a large flat with scattered cover fishing spinnerbaits and texas rigging Berkley Havoc Hawk Hawgs and a Berkley Crazy Legs Chigger Craws. We ended up weighing in 11.70lbs anchored by a 5.31lb largemouth that I caught texas rigging the Hawk Hawg. Our bag could have been much larger except for a big break (pun intended) suffered halfway through the day. I hooked into a bass that appeared to weigh approximately 8.5lbs on a spinnerbait. I wrestled the fish up and out of the brush and as it was on the surface well on its way into the net my spinnerbait broke in half! Of course the fish got the half with the hook and I got to keep the blades. On Day 2 the bite was much tougher as fish pulled much tighter to cover and weren't to be tempted by fast moving baits. The fish we were able to land came from the thickest parts of the largest trees and bushes. We lost a couple of key fish out of the thick stuff and ended up weighing in 9.32lbs for the day. 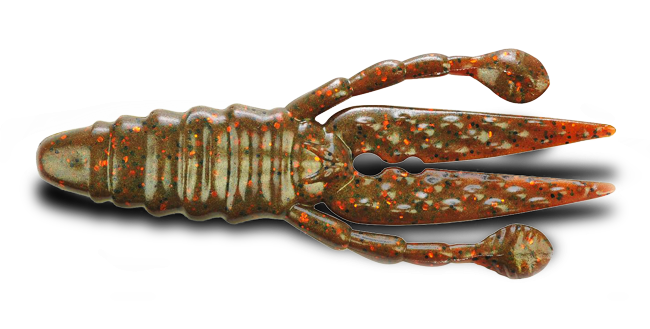 I needed baits that had a little thicker body on Day 2 so I primarily fished with the new Berkley Powerbait Thief but also mixed a Berkley Havoc Craw Fatty on occasion. I used Abu Garcia Villain/Revo MGX spooled up with Trilene 100% Fluorocarbon both days and as usual my equipment performed flawlessly. We had a total two day weight of 21.02lbs which put us in 11th place. I want to congratulate Matt Shura and Mike Brillhart for winning the tournament. Their hard work paid off and if they feel like I did last year I know they must be really happy to have won a new Ranger boat. It truly was an honor to have a chance to defend our title at such an amazing tournament. ABA and the sponsors that help put the tournament on did a fantastic job and Lucas Oil really came through in a big way once again. I can't wait to take another shot at winning it next year! I just finished fishing the Bill Luke Bass Days tournament at Lake Pleasant on March 16th-18th. Although I wasn't able to catch the biggest bed fish that I found during practice, I was able to land a 5.40lb bass that secured victory for me on Friday. This was the first time I was able to use my new Abu Garcia Villain Rods and Revo MGX reels while sight fishing and I must say that I was very impressed. I was able to immediately feel every bite during the windy conditions and the Villain rods loaded and handled the fish effortlessly. 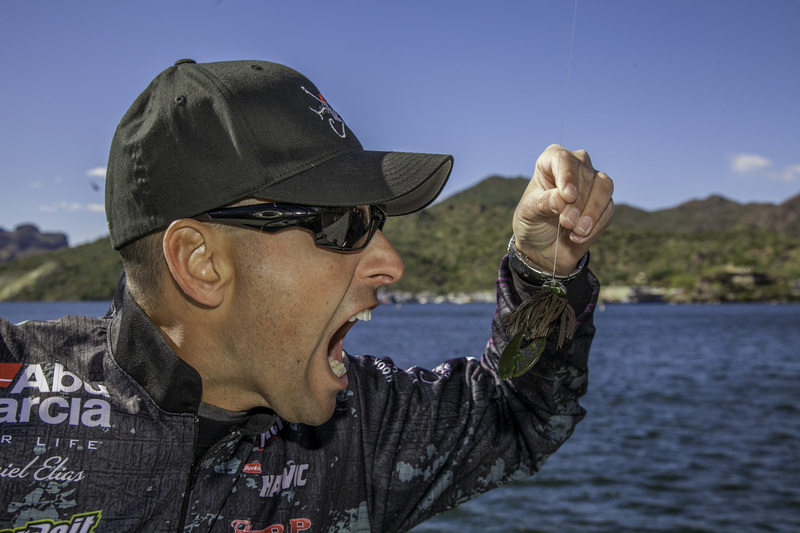 I'll be speaking during a seminar at Bass Pro Shops in Mesa, AZ on Tuesday, March 13th at 6:30pm. I'll talk briefly about winning last year's Lucas Oil Tournament sight fishing, and I'm going to share the baits and set-ups I used to win. I'm also going to talk about the Alabama Rig, the newest and latest craze in bass fishing. I'll share which brands and models work best and explain why they tend to out fish the others. 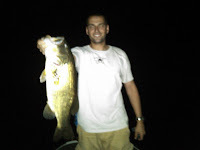 I will also show various ways to rig it and share a few secrets on how you can set it up in order to catch more fish. The seminar will be held upstairs in the fine gun room and it is free to attend. I hope to see you there! 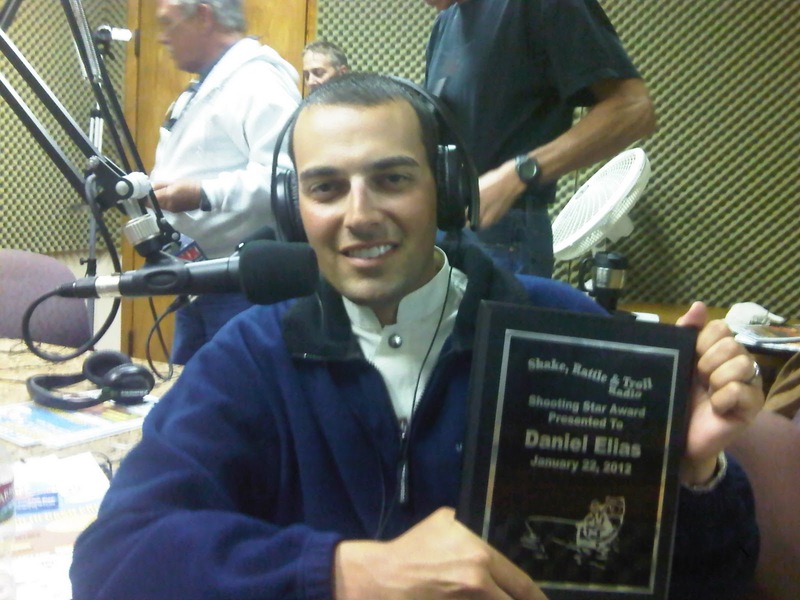 I received the "Shooting Star" award live on the Shake, Rattle, & Troll Radio Show yesterday. Don McDowell and Shake, Rattle, & Troll Radio gave out the Shooting Star Award to the person that they felt was the best up and coming professional bass angler in Arizona. I'm truly honored to receive this award and it's especially satisfying as this is the first time it has ever been given out. Also during the show Keith Espe received the "Angling Visionary" award, Tai Au received the "Angling Ambassador" award, and Bill Ruehle received the "Sportsman of the Year" award. I'll be back on the Shake, Rattle, and Troll Radio Show (KFNX 1100AM) on Sunday January, 22nd from 7:00am-9:00am. Apparently I'm going to be honored with an award but I'm not sure what the award is for yet as they want to keep it a surprise. Tune in on Sunday morning and you can be surprised with me. 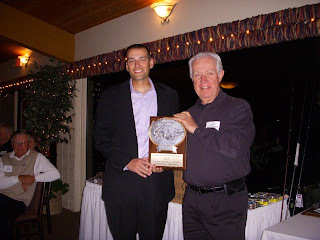 I attended the Midweek Bass Awards Ceremony last night where I was presented with the 1st Place Boater of the Year Award for 2011. The awards ceremony was once again top notch and it was great seeing all the guys come out with their wives and not be dressed in the typical fishing attire. I want to congratulate Jeff Martineau for a job well done, he had one heck of a season. Time to get ready for next week's tournament at Bartlett Lake. I just finished fishing the Midweek Open / AZ Game & Fish Benefit Team Tournament on Lake Pleasant, AZ with my team partner Butch Nessline yesterday. We finished in 2nd place overall during a very tough day of fishing against a field that included both B.A.S.S. Elite Series and FLW Tour pro's. We got off to a pretty slow start fishing drop shots in deep water and didn't put our first fish in the boat until about 1:00pm. During the afternoon as the water warmed up both the shad and bass started to move shallow to feed. We were able to take advantage of this and hit a little flurry during the last hour of the tournament when I caught 4 fish on a Berkley Powerbait Ripple Shad (Green Back Pearl). We wound up weighing in a 4 fish limit of 12.24lbs and had a big fish of 4.82lbs. Midweek Bass donated 20% of the entry fee's collected to the Arizona Game and Fish Department for the construction and installation of fish habitat in Arizona Lakes. Pretty Cool! I was featured on the Shake, Rattle, & Troll Radio Show on Sunday. It was great to be down in the studio again and like usual, we had a great time. In addition to our discussionsabout fishing we also talked about the new Abu Garcia Revo MGX Reels & Villain Rods, as well as the upcoming Midweek Bass Open Tournament at Lake Pleasant. Play the clips below to listen to the radio show in its entirety. Below is the information on Alabama rigs we discussed. Is the “Alabama Rig” legal in Arizona? Arizona Revised Statutes 17-101 A1—“Angling” means the taking of fish by one line and not to exceed two hooks, by one line and one artificial lure, which may have attached more than one hook, or by one line and not to exceed two artificial flies or lures. The Alabama rig appears to be up to five (or more) lures joined via stiff wires, similar to umbrella rigs used for trolling. These “rigs” with more than 2 lures, would not be legal for angling in AZ. Such a “rig” would be legal if it had no more than two lures. Lures are not defined in statute. However, a lure is designed and intended to catch one fish. As such, a spoon, soft bait, piece of yarn etc., with no hook incorporated would not be considered a lure. Thus, a test would be if a “rig” (Alabama or otherwise) were to be de-constructed, each piece that can catch a fish separately would be considered a lure. If more than two lures (that can catch a fish separately) are de-constructed, the rig is not legal in Arizona as regulations are currently written. An example of a rig that would be legal in AZ is a rig with two swim baits with hooks and three or more (as many as you want) hookless swimbaits or hookless spinners. It has been a tradition of mine to get out and go fishing on my birthday and this year the tradition continued. I have fished at Lake Pleasant by myself on my birthday for the last 7 years straight. There is something nice about being alone in your boat and fishing at times. No worries, no pressure, no conversation. Don't get me wrong I definitely like to fish with someone else and usually do so but occasionally I enjoy being alone. This year I went armed with some new Berkley Havoc Bottom Hopper Worms. I've had them for a couple months but this was the first time I threw one. I rigged a Green pumpkin/Gold Havoc Bottom Hopper on a 1/4oz Bite-Me Shakey Head and fished it on a spinning rod with an Abu Garcia Revo Premier Spinning Reel. Lake Pleasant provided a pretty nice birthday gift as I was rewarded with about 20 fish, one of which weighed about four pounds. The Alabama Rigs that I ordered three weeks ago finally showed up at the house yesterday. I had a chance to get out on the water today and after throwing it for about an hour I caught this double. I initially hooked one fish and as I was reeling it in when the second fish came up and grabbed another bait. It was a heck of a lot of fun as I haven't caught a double in quite some time. My new Abu Garcia Revo MGX reels were delivered to my house today and let me tell you, I was excited! I didn't have time to make it to the lake so I spooled one up and drove out to the urban pond to test it out. This reel is incredible, so lightweight, unbelievably smooth, and it casted like a dream. I actually caught this chunky five pounder on my second cast.... I hope the trend continues. 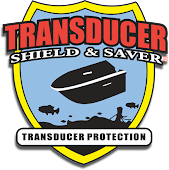 I attended iCast 2011 on July, 13th-15th and saw some amazing new products. This sure seemed like the year of the reel as the vast majority of companies who manufacture reels released completely new or significantly redesigned models at this year's iCast. 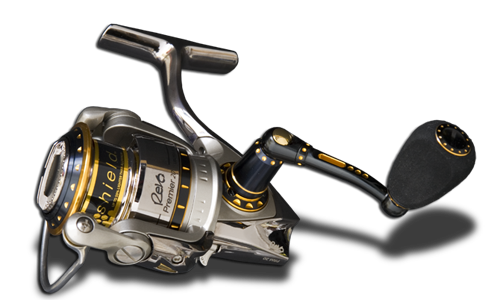 There was simply no better new reel out on the floor than Abu Garcia's new Revo MGX. This top of the line reel is packed full of the finest features in the industry but weighs in at only 5.4 ounces! The MGX is so good that it won the "Best in Show Award" for Best New Freshwater Fishing Reel at iCast 2011. You definitely need to check them out when they hit store shelves this fall. Berkley Nanofil won a "Best in Show Award" for Best New Fishing Line at this year's iCast and also went on to win the "Overall Best in Show Award" which covers all new products that were displayed during iCast 2011. 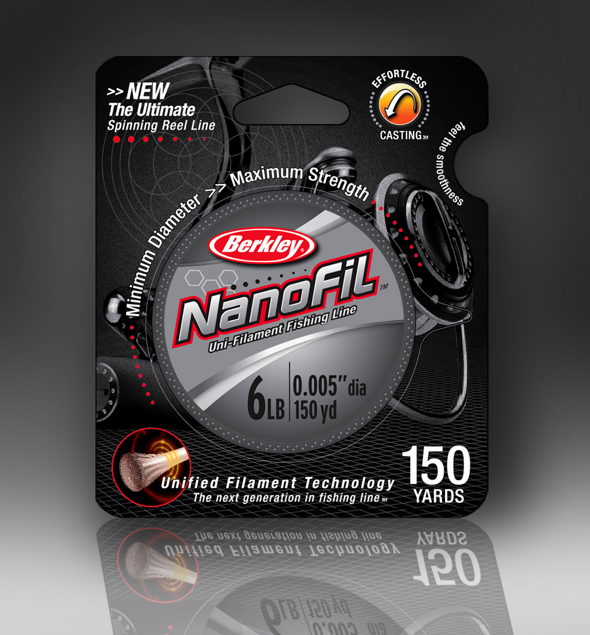 This new line was designed specifically for spinning reels and is made using gel-spun polyethylene and Dyneema nanofilaments. It's super strong like braided line but handles like an incredinly smooth monofilament. Check it out! I just finished doing a little summertime sight fishing. However, this definitely wasn't typical sight fishing where the bass are on beds. Air temperatures were pushing over 105 degrees and the water temperatures were in the low 80's. My tournament was at Lake Pleasant where the water clarity can reach 30+ feet. The fish were sitting in about 15-20ft of water and since there was absolutely no wind yesterday I was able to look down and see quite a few fish roaming the lake bottom. I actually caught over half of my fish by visually locating them before I cast. Most fish were caught using a 4" Oxblood/Red Fleck Berkley Hand Poured Finesse Worm on a drop shot rig. I caught enough fish with my draw partner Ralph Skelly to weigh in 9.56lbs which earned us a 2nd place finish. I was able to fish the Reel Heroes event at Lake Pleasant yesterday that Clay Lippincott organized. 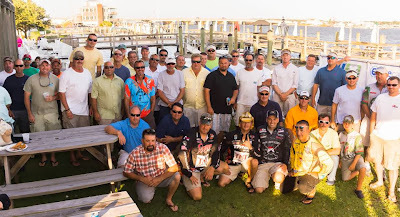 We volunteered to take active military and military veterans out fishing for a fun tournament. I was lucky enough to be paired with SSG Kevin Sartor from the Arizona Army National Guard (pictured above). We caught quite a few fish and ended up doing fairly well taking 2nd place in the tournament. It was truly an Honor to fish with SSG Sartor. I can't express how much I truly appreciate soldiers like him. These men and women put their lives on the line to protect our freedoms and allow us to pursue the American dream. Now those are real heroes! I was late for weigh-in at a tournament for the first time ever yesterday, whoops! I had looked online and noted the tournament hours but unfortunately, I was looking at the wrong tournament. I was running a bit late driving to the tournament and I didn't bother to verify my weigh-in time which happened to be 3 hours before I thought it was! When I arrived back at the ramp everyone had already packed up and left and my truck was the only one left in the parking lot. I still have no idea how I missed all those boats driving past me heading in to weigh their fish. I went over to Cabela's in Glendale, AZ for a photo shoot with the new Ranger Z118 I won at the Lucas Oil Open tournament in April. We did a photo shoot in front of the store with the boat for the Lucas Oil staff and I must say that the boat looked great. It sure was nice to see and thank the people from Lucas Oil and American Bass again. It's pretty awesome to see a company like Lucas Oil supporting bass fishing. As bass anglers we should really attempt to support companies who support us. Check out Lucas Oil's Marine Ethanol Treatment next time you buy ethanol protection for your boat. I had the honor of appearing as a featured guest on the Shake, Rattle, & Troll Radio Show on KFNX 1000 this morning. The show ran from 7:00am-9:00am and we discussed my win at the Lucas Oil Open at Lake Pleasant, pre-fishing strategies, and sight fishing among other topics. Don McDowell runs a great show and Marc Townsend keeps things interesting to say the least. I can't wait to do it again.